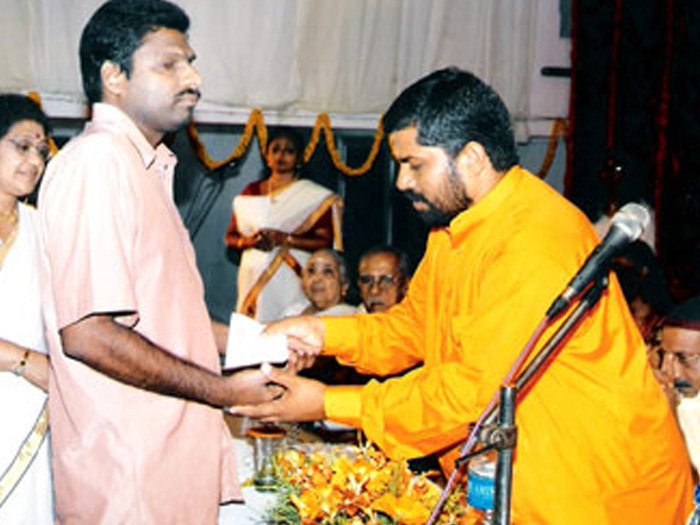 After initiating and coordinating several projects in Chinmaya Mission for about a decade, Swamiji, then known as Br. Sandeep Chaitanya, created history by conducting the 108 days continuous discourse series on the Bhagavad Gita. 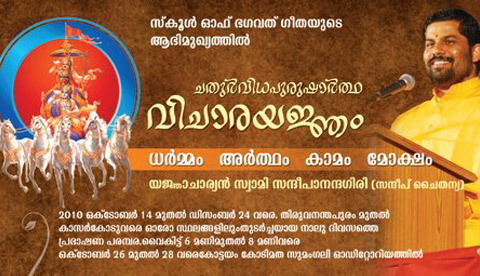 Held at the Vyloppilli Samskriti Bhavan Open air auditorium in Trivandrum, the event attracted a daily audience of around 2000. Swamiji’s simple explanation of the Gita, replete with examples from everyday life and laced with his inimical humour was an eye-opener for the common man. Following this up with the telecast of the complete series on ACV, this Gita Yajnam was singularly responsible for bringing the Bhagavad Gita down to the masses who, regardless of caste or creed, began to understand it clearly, accept and appreciate it whole-heartedly. History was repeated in 2005-06 when Swamiji’s Sampoorna Gita Jnana Yajnam was held in Cochin for 108 days continuously from December to March. 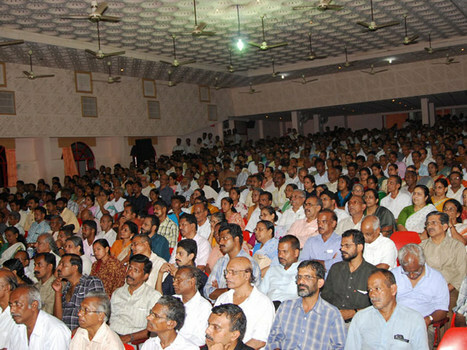 An audience of over 2000, comprising of the public from all walks of life, sat enthralled daily, listening to Swamiji as he unraveled the beauty of the Gita before them. This Discourse series titled Sampoorna Gita Jnana Yajnam was telecast and re-telecast continuously since April 2006 for two and a half years ,daily on Doordarshan, the national TV network of India was viewed globally, proving its acceptance and popularity. 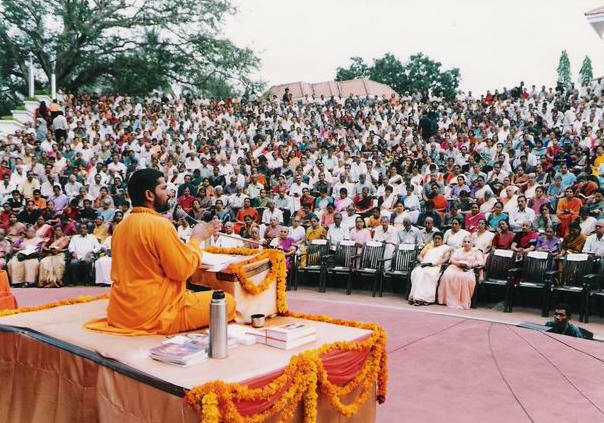 In 2006 Swami Sandeep Chaitanya founded the School of Bhagavad Gita with a vision to expound the universal character of the Bhagavad Gita and its practicality in everyday life. The aspiration is also to nurture the true essence of India’s cultural and spiritual heritage with all its open-mindedness and tolerance. The ultimate mission of the organization is to reach out and benefit a wider section of the population across the globe. 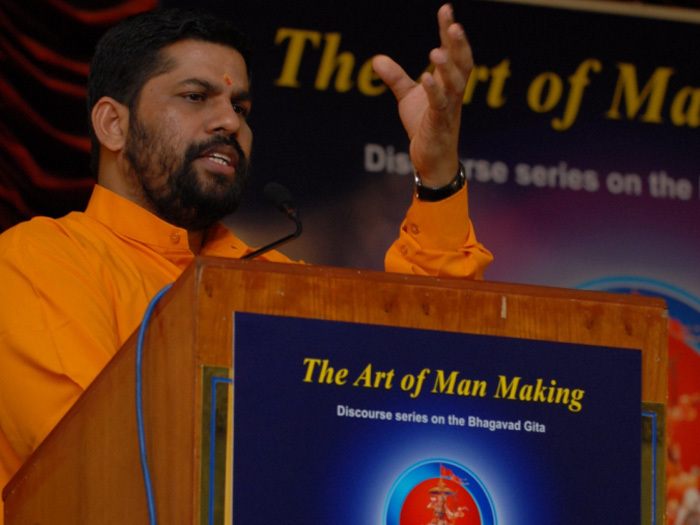 The Art of Man Making, a 45 days long event held in 2007 at The Indian Consulate hall, Dubai, was a mile stone, whereby discourses on the entire Gita was held for the first time ever in the UAE. 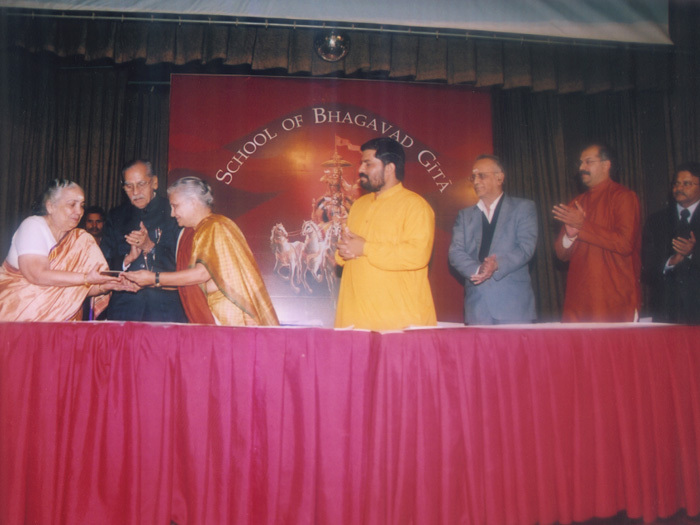 In April 2007, Swamiji launched Tamaso Ma Jyothir Gamaya- the project of presenting the Bhagavad Gita in Braille for the visually impaired- to kindle the light within. For the first time, the Gita was published in Malayalam Braille. The copies, along with their MP3 audio CDs, were released by eminent poetess and social activist Padmasri Sugatha Kumari, who distributed them to deserving visually impaired students. 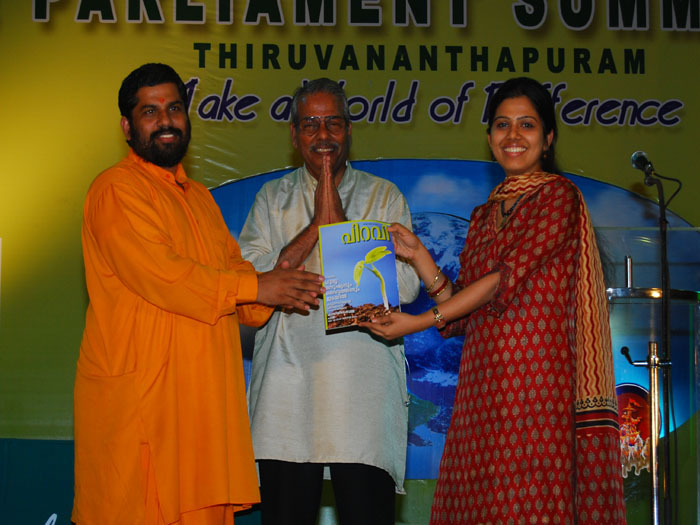 Realising the absence of a positive outlook magazine in Malayalam that can be enjoyed by all, Swamiji launched PIRAVI in August 2008, under the editorship of Sri. C. Radhakrishnan. It is meant to be a forum where members of the general public, from the common man to the scholar, can together enjoy spiritual reading or give literal expression to their thoughts and a vehicle that will deliver the goods to suit the spiritual needs of our time. 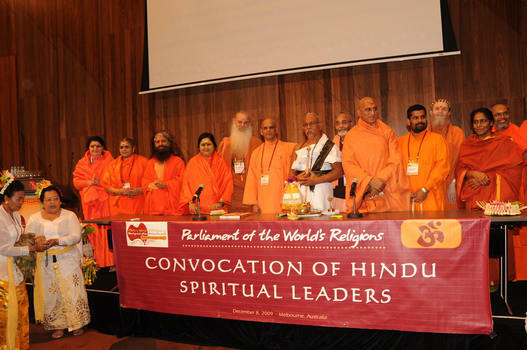 Making a World of Difference - the Pre Parliament Summit of the Parliament of the World’s Religions was hosted and organized by SOBG under the leadership of Swamiji. 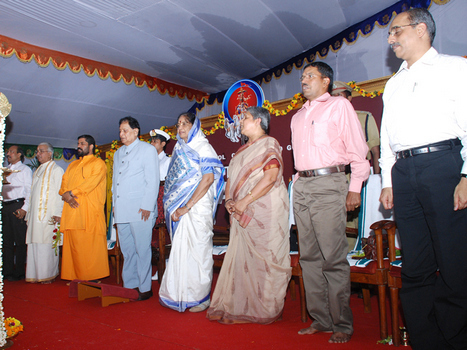 It was inaugurated in Trivandrum by Geshe Lama Thubten Gurung on 3 August, 2008, amidst the presence of a wide and varied gathering of internationally known speakers and audience. Chatur Gakaara Vichara Yajnam was a major state-wide programme that was organized and conducted by Swami Sandeepananda Giri from the 9th of October 2008 to the 4 th of January 2009. A comprehensive programme of talks and cultural, river and environment protection campaigns of 4 days each, covering all the 14 district headquarters of Kerala, it stressed the importance of the 4 Gakarams – Gita, Ganga, Govinda and Gayatri – and their relevance in our daily lives. 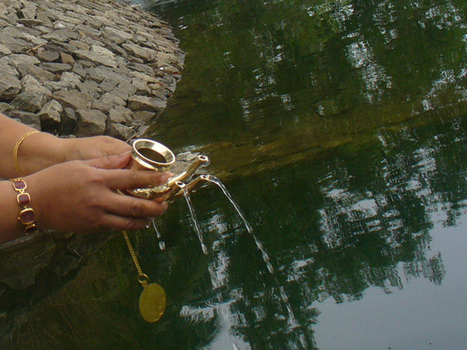 One day of each session was devoted to Nadi Darsanam, when Swamiji visited the main river of the respective district. In the course of these visits Swamiji met local residents and interacted with environmentalists to study the situation and advised the people and the governing bodies to adopt one river at least as the River of the District and look after its conservation. GANGA DARSAN at Haridwar on the 31st of December 2008 was the finale of Chatur Gakaara Vichara Yajnam, the 3 month long, state wide comprehensive programme of talks and cultural, river and environment protection campaigns of 4 days each at all the districts of Kerala. The Sagar- Ganga Darsan Yatra which began on the 28th of December attained a new dimension and national importance with the declaration of Ganga as the National River and is the first journey of its kind in the country. 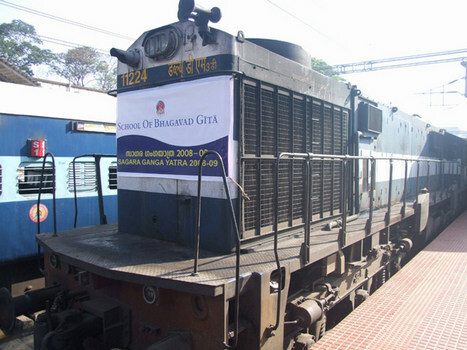 Around 2000 people from Kerala travelled from the sea shores of the Land’s end at Kanya Kumari, down south, to the bosom of the Himalayas in the North at Haridwar on a specially sanctioned train. 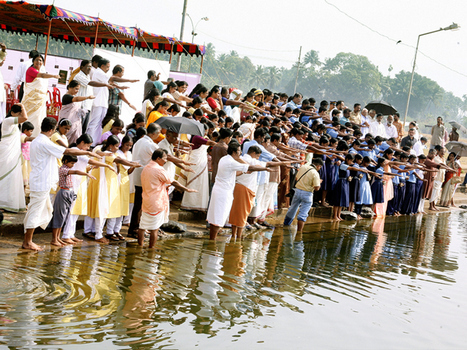 Upholding the sense of solidarity and oneness with the Nation, this was the journey of an awakened populace to take a pledge and cleanse the polluted waters by bringing the holy waters of the Ganga and sprinkling it in all the 44 main rivers of Kerala in a symbolic gesture. 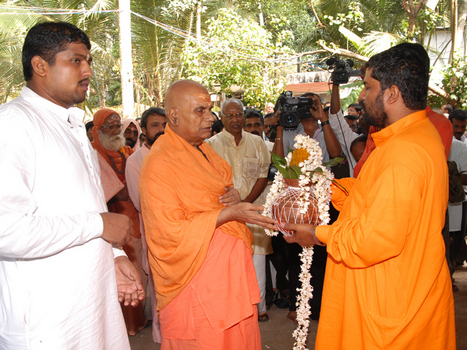 Salagramam Ashram – The Temple of Knowledge – founded by Swamiji was inaugurated on 9/9/2009. 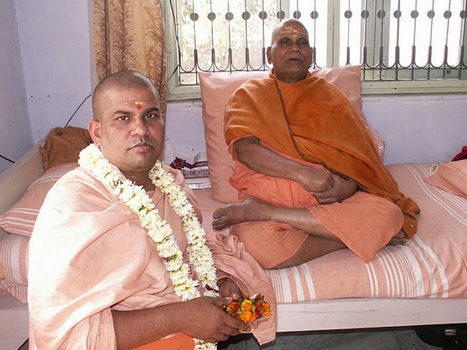 Acharya Mahamandaleswar Swami Kashikananda Giri Maharaj opened the doors of this Temple of Knowledge to the world with the installation of Bhagavan Veda which was handed over by the Maharaja of Travancore after puja at the shrine of Bhagavan Veda Vyasa at the Sri Padmanabha Swamy Temple. 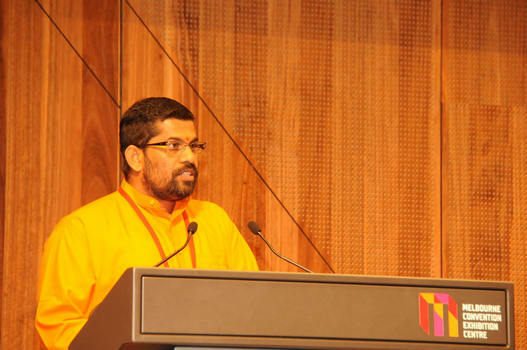 Swami Sandeepananda Giri was invited to address the Parliament of the World’s Religions held in Melbourne, Australia from the 3rd to the 9th of December 2009. 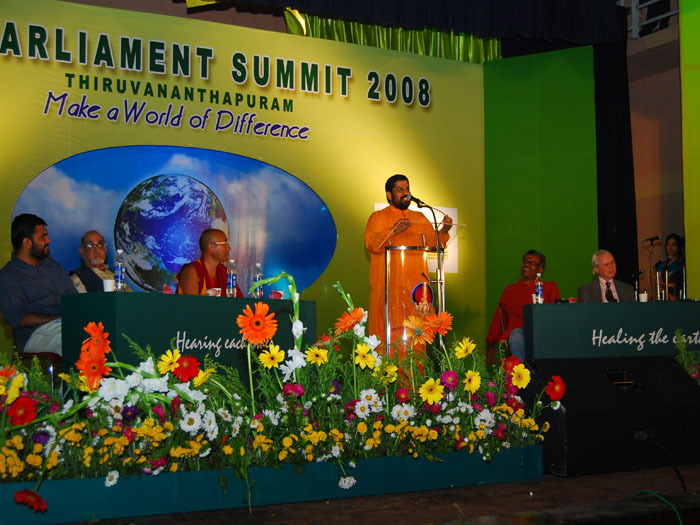 The invitation to Swamiji came in recognition of his work that reaches out to the common man with the message of true spirituality and his efforts for the environment underlining that "Worship of Nature is Worship of the Divine".At related events in the Parliament,Swamiji also conducted an Observance entitled “Viswamitra - In Union with the Universe”. The Parliament of the World's Religions - the largest inter-religious congregations in the world - opened with a series of blessings that acknowledged and honoured the diverse spiritual and religious traditions of the world. Swamiji representing the Hindu faith, offered blessings of peace to the world with the chanting of 'OM', the universal mantra, followed by the Shanti mantra - 'Poornamada' of the Upanishads. 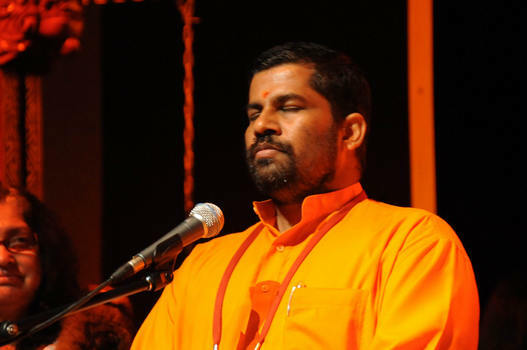 Swami Sandeep Chaitanya was ordained Sannyasam, following which the name of Swami Sandeepananda Giri was given to Swamiji. The ceremonies of the sannyasa deeksha took place in Haridwar from the 11th to the 13th of March 2010, during Kumbh Mela. Swamiji received this solemn order from the most blessed H. H. Dwadasha Darshanaacharya Mahamandaleswar Swami Kashikananda Giriji Maharaj. Former President of India Dr. A.P.J. 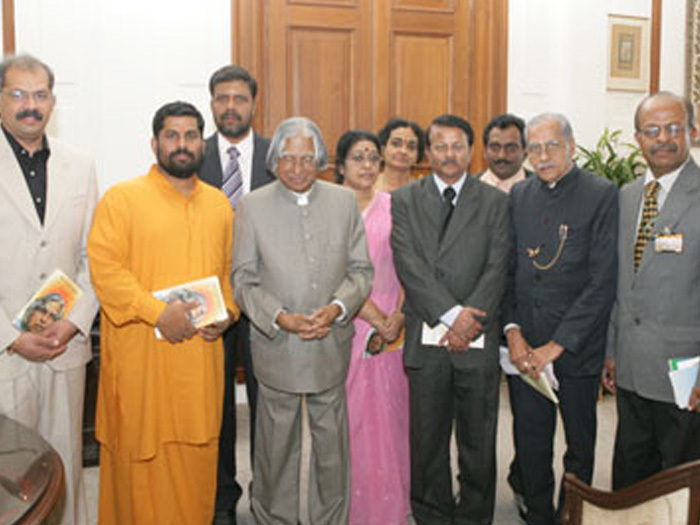 Abdul Kalam visited Salagramam on 14-10-2010. 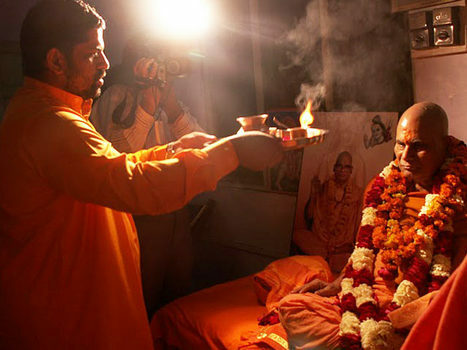 Kalamji inaugurated the meditation hall "Geethakshethram" and dedicated it to all seekers. 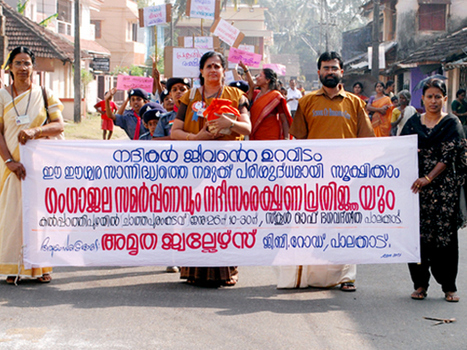 A 72 days long mega event of discourse series in 18 venues covering all 14 districts of Kerala from October to December 2010. 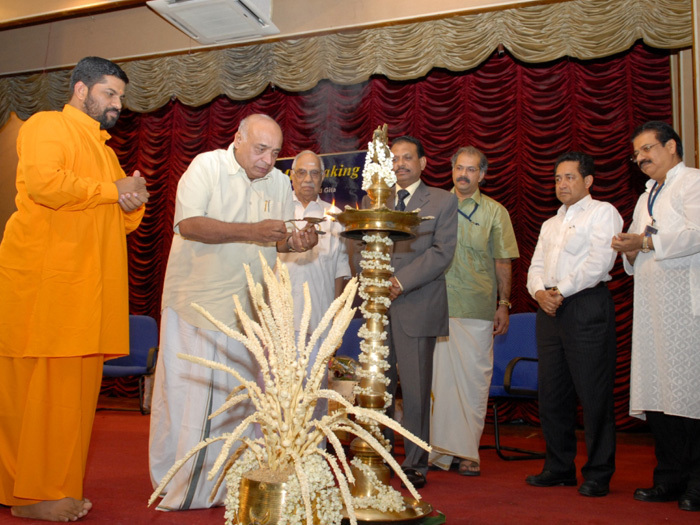 The series was based on Purusharthas, or the four aims of human life - Dharma, Artha, Kama and Moksha- was inaugurated by Dr. A.P.J. Abdul Kalam. A ground-breaking change was brought about by Swamiji in the narration and explanation of Srimad Bhagavadham with his 54-days long Discourse held at Trivandrum in 2013. Going beyond mere story-telling and rituals, the public was treated to a deeper understanding of the scripture when Swamiji unraveled the symbolism and principles embedded in this glorious work. A state-wide Heritage Discourse series illuminating the salient and unique features India’s spiritual philosophy and culture.